Whether doing prehab, rehab or training, I believe in using single leg exercises to attack asymmetries, imbalances and motor deficits I uncover in my assessments. Learning to control one’s body in space with the effect of gravity in a weight bearing position is instrumental for sport and injury prevention. Furthermore, facilitating ankle mobility and proper knee alignment during a loaded squat pattern is something most athletes and clientele I work with need some help with. to that end, I utilize several different single leg reaching progressions and exercises. One of my favorite ‘go to’ exercises is the anterior cone reach. I recently featured this specific exercise in my ‘Functionally Fit’ column for PFP Magazine. Click here to see the video demonstration. 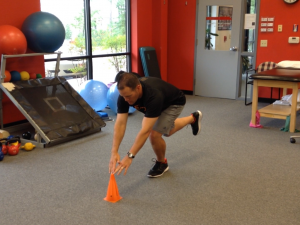 This is a great exercise with progressions and regressions for clients of all ages and abilities.